In Psoriasis, skin becomes red,itchy, thick and scaled. It mainly affects skin over the elbows, knees, and scalp. Though, any area of the body can get affected, and is more common in areas of friction, trauma, or rubbing. The main cause of Psoriasis is unknown, but mainly it is caused when your skin cells turn into Type A Overachievers. Meaning, the cells mature five times faster than cells in normal skin. The interplay between genes and triggers is considered as the major reason for its cause. These cells pile up on the skin cells unlike normal skin cells that sloughs off naturally. Psoriasis develops when something triggers the immune system mistakenly. Revitol Dermasis cream is specifically designed to treat this severe skin condition. Ingredients in Revitol psoriasis cream relieves the symptoms of the Psoriasis, thereby treating it. 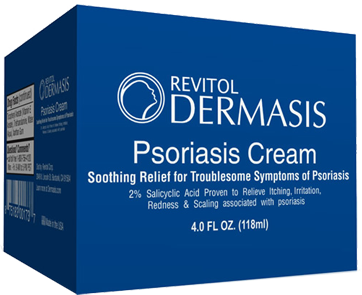 Revitol Dermasis Psoriasis cream penetrates deep into the skin and provides a thin protective layer. Revitol dermasis cream ingredients include 2% salicyclic acid as an active ingredient. It is used because it has the ability to slough of the dead skin cells from the affected area and even help reduce pain and discomfort caused by deep cracks. Palm Oil: Palm oil is an edible vegetable oil. When present in Revitol, it penetrates deep into the skin and forms a thin protective layer that holds in moisture to keep it soft and supple. Vitamin E Acetate: Vitamin A is an antioxidant which increases moisture in the skin. It even protects the skin from harmful UV rays, and helps skin stay healthy. Melaleuca Alternifolia: Commonly known as tea tree oil. It has natural soothing and cleansing properties that help alleviate itching, burning, and irritation related to a psoriasis outbreak. Moreover, this substance has been used for thousands of years to treat a variety of skin disorders. These three are the main revitol dermasis psoriasis cream ingredients along with salicylic acid and hylarounic acid that helps treat Psoriasis keeping its effect permanent.